We cleaned a Vintage Water Bag today. When it’s owner brought it to us to see if we could clean it we couldn’t see any labels or markings. As we were dusting the branding, and descriptions were revealed. 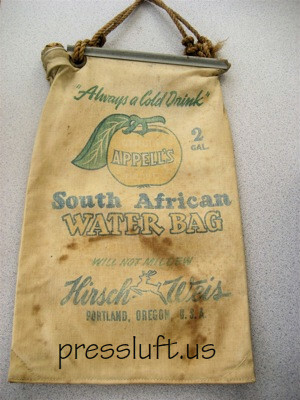 Now the Appell’s logo and slogan “Always a Cold Drink” along with “South African Water Bag” are clearly visible. Although not a rug, it is made of a Natural Fiber- called Duck Flax (canvas). It was commonly hung on the front of a car to keep water on hand for the radiators that would frequently overheat. We understand these were also popular with The Boy Scouts and farm laborers both known to have used them for storing drinking water. The listing for it’s patent shows up in The Official Gazette of The United States Patents Office- Jan 13, 1906. We also found it for sale in Popular Mechanics, May 1928 page 139, selling for $1.65. The ad listed that it would keep 2 gallons of water cool for 48 hours. This one still has the original cork in the top left corner. Very Cool Stuff!